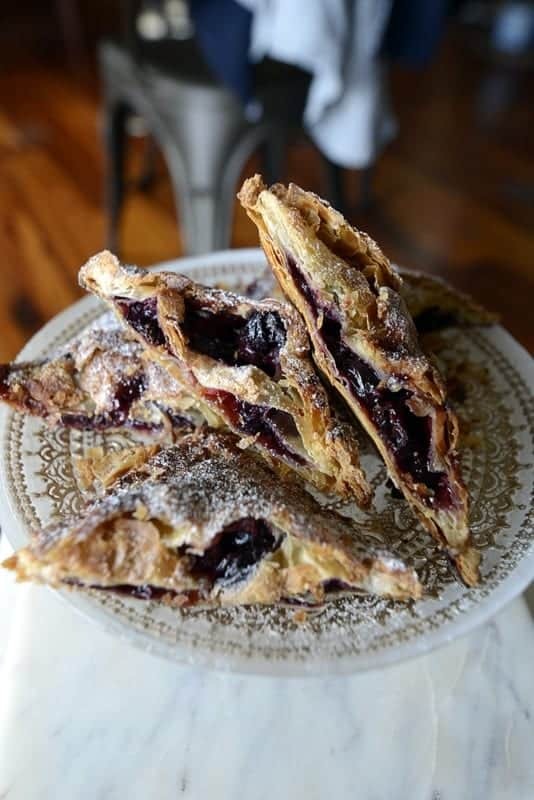 Grab a cup of java or cup of your favorite tea and bite into this hand pie, crunchy cherry hand pie that is and you’ll experience a small taste of nirvana! Back in West Virginia when I was a kid, hand pies were one of Mom’s best treats she’d make for us kids. She’d fill them with different fruits, apples and berries. But, my favorite were her cherry hand pies. 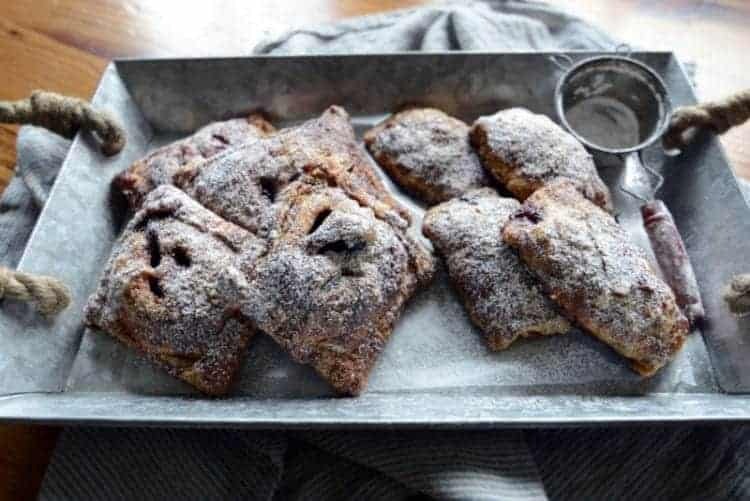 And, these crunchy cherry hand pies are great because I’ve skipped the step of frying and baked them. Still getting that crunch and crisp that is so loved when you bite into a hand pie with juicy sweet fruit! First of all, I have a serious disclaimer when it comes to baking. I am a ‘rogue’ baker, which basically means I usually approach my baking as I do my cooking, intuitively. 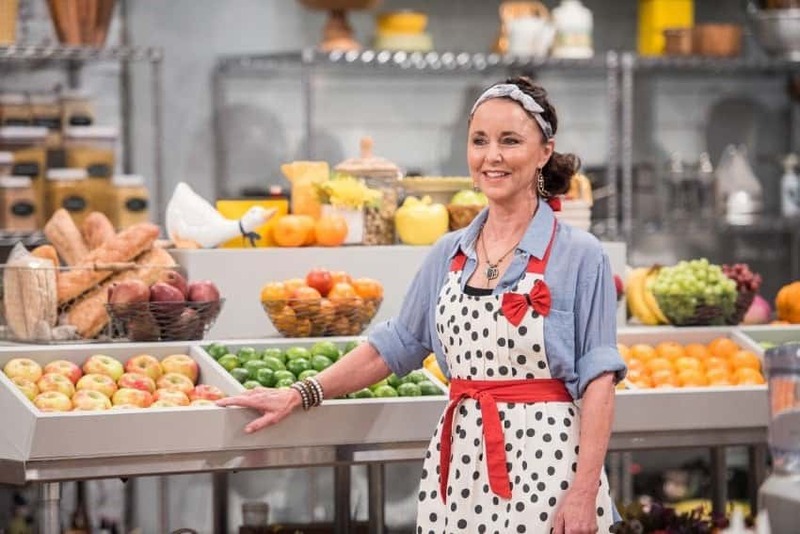 It also means that my baking creations probably won’t win any America’s Best Baking contests because they’re typically rustic, earthy and organic looking. In other words, nothing really fancy and swanky that you’d serve at a State dinner or a fancy French restaurant. 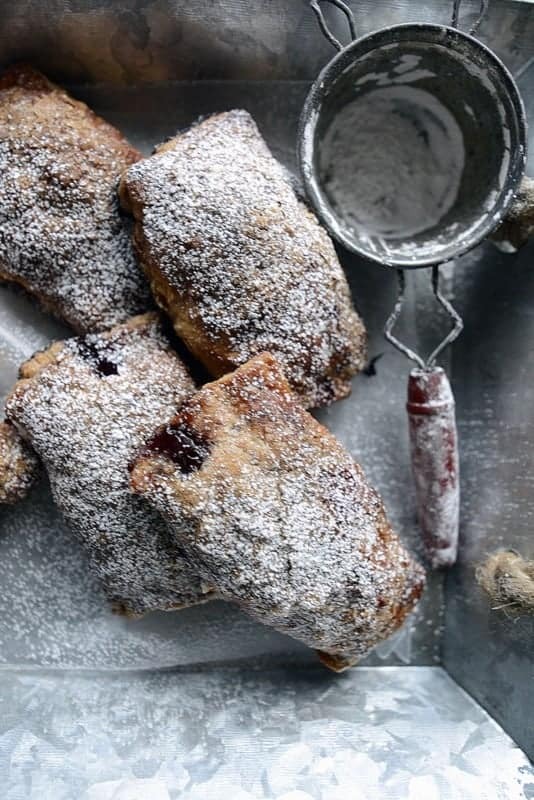 But, there’s one thing that is always present in my desserts and sweets and that is they’re usually easy to make and they’re totally delicious! Now, to make this recipe really simple we’re going to use puff pastry. By doing this, we side step a lot of time and energy in dough preparation. 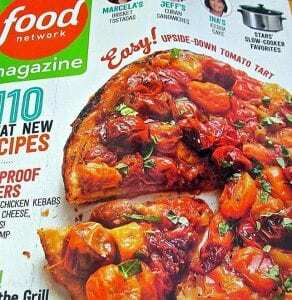 And, I’m a total lover of puff pastry because it’s always consistently great for cooking both sweet and savory. Now, to get some added flavors, we’re going to be using orange marmalade. Try to buy the best brand of orange marmalade you can. One with visible and plentiful gratings of orange peel. And, we’re taking the easiest step of all. 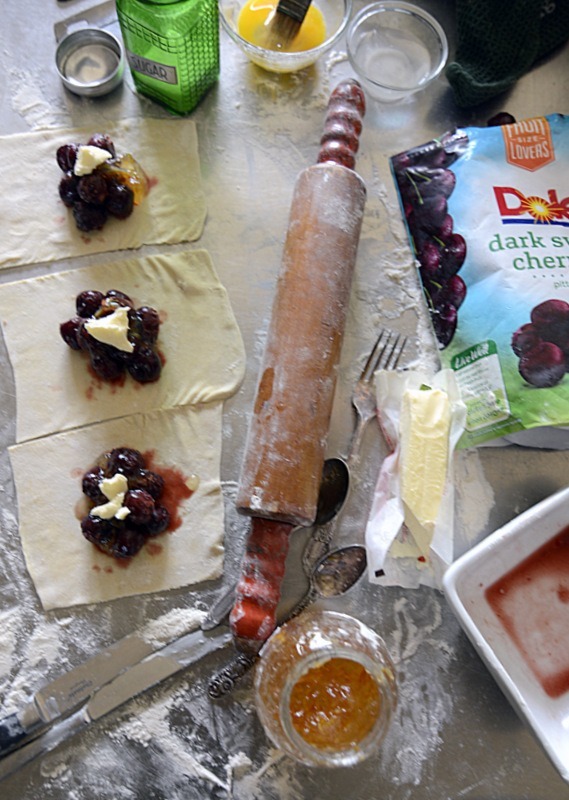 We’re going to be using Dole Sunshine’s frozen cherries! Now, if you haven’t tried them, you are in for a tasty experience because these cherries are large, plump, sweet and harvested and packed immediately at the peak of ripeness. If you want to check out another really simple easy ‘rogue’ sweet recipe of mine, I think you’ll like this one! Place the flour on a clean surface and make a big circle with it. Lay one puff pastry strip on the flour. Roll it out to about a 5 x 12” size. Cut it into three large pieces. Put about 8 to 10 cherries in the middle. Add a heaping teaspoon dollop of the orange marmalade and a piece of butter. Fold over the long sides and pinch together (making a ‘seam’). Fold the opposite sides and use a fork to seal the pastry dough. Place (seam side down) on a parchment paper covered cookie sheet. Repeat with the remaining pastry dough. Use a pastry brush and brush the tops with the egg wash. Sprinkle with equal amounts of sugar. Bake in a preheated 350 oven about 29-32 minutes or until golden brown.